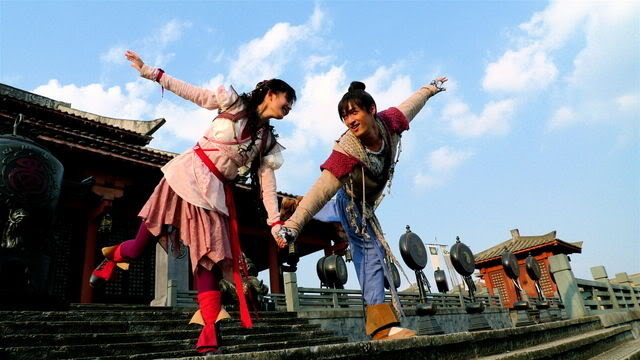 Last night, we finally reached Episode 37, the final episode of Chinese Paladin 3.
a good sense off the show. While there are a few things I would have changed in Episodes 36 and 37, it remained up to it’s extraordinary level of entertainment right from Episode 1 straight through Episode 37-ten minute from the end. The last ten minutes were A. totally dumb, B. made no sense in the magic system, C. made not sense in the inter series plot-line. I wish I could write things like this. The weirdest and funniest part to me, however, is how many people I got wrong in the closing credits. We watched this quite a few times in China and many times since we got home, and nearly everyone I first thought was someone else or had a wrong opinion about what the scene meant….right from the very first images–who turned out not to be the character I first thought it was…up until the last twenty minutes, where I discovered I’d made a mistake about yet another character in the closing credits. Still, it was both beautiful and fitting for the story. January 11, 2010 in Uncategorized.